Between October 22 and December 3, 2015, citizens were asked how government could save time, provide easier access to services, and reduce red tape. From March 1, 2016 to April 10, 2017, British Columbians continued to send their ideas to help cut red tape and the B.C. government provided responses. We heard from people all over the province including the Cariboo, the Thompson Okanagan, the Northeast, the North Coast, Vancouver Island and the Coast, and the Lower Mainland. By the end of the engagement, more than 800 submissions with 689 unique ideas were received. The B.C. 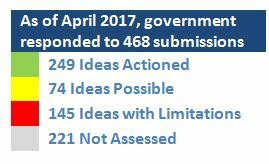 government provided responses to 468 ideas. Some ideas were not reviewed because they were received as the engagement was closing, however, these ideas were forwarded to ministries for consideration as part of ongoing service improvement efforts. The submissions were grouped into different categories based on the issues citizens identified. Below are the top seven themes and how the B.C. government responded to them. After ideas were submitted, they were reviewed by experts at each ministry and projects were prioritized for further work. In total, 249 ideas were acted on by government, which included linking citizen feedback into projects that were already underway or creating new projects to address a gap identified by a citizen. Regardless of whether government was able to act on the suggestion or not, citizens who submitted an idea received a response from government and the response was posted on the Help Cut Red Tape website. Some people had stories of time-consuming or difficult requirements they were asked to complete in order to access a government service or be able to carry out an activity regulated by government. For example, one submission talked about the process of applying for Persons with Disabilities (PWD) assistance. Example Action: In 2016, legislation was passed allowing government to prescribe groups of people that can be designated as persons with disabilities without having to submit the full 28-page application or complete additional assessments by medical practitioners. This change has streamlined the application process for many people. We heard stories from submitters where they had prepared requests or applications, but were waiting for government to respond. For example, Sandy said the child care subsidy application takes too long and telephoning also had long wait times. Karen suggested implementing a call-back system for child care subsidy applications so you don’t have to wait on hold. Example Action: As requested by Karen, Sandy and others, a new telephony system for inquiries about the child care subsidy (and other services) has been implemented by Ministry of Children and Family Development which allows for call-backs. In addition, a new Service Provider Portal allows clients to apply for services, check the status of their applications, and receive communication about their cases. Some people pointed out errors, missing information and confusing language for government services or requirements. For example, one writer found the information online about changing the address associated with a BCeID account unclear and when they asked for clarification at their local Service BC office, staff were also unsure. Example Action: In response to the inadequately explained requirements related to BCeID address changes, the Ministry of Citizen Services updated the BCeID website and added further explanation to customer service training materials. Citizens expressed support to continue modernizing government services, whether that is updating policies or putting more services online. For example, Tom suggested a digital hunting certificate that he could put on his phone to represent his hunter number and CORE certificate. Some people expressed frustration and confusion trying to access the right government service and offered suggestions to improve the front counter experience and provincial government phone services. For example, Donna suggested better training for frontline counter staff. Example Action: Thanks to the feedback from Donna and others, government is revising and expanding the customer service training that frontline staff receive. We heard stories of citizens confused or frustrated by situations in which a lack of coordination or consistency between government agencies meant more work for them. For example, people who had to notify government offices and agencies about the death of a loved one expressed frustration with being required to contact multiple agencies. Example Action: In response to the issues raised regarding death notification, the provincial government has launched a cross-government initiative, which will develop a more coordinated approach to electronic death notification information across provincial government agencies. Some people had suggestions related to particular taxes, fees or compliance requirements that were individually or cumulatively onerous. For example, members of the hospitality industry reported a negative impact on their business because they are limited to buying directly from the BC Liquor Distribution Branch at retail prices instead of cheaper wholesale prices or directly from producers. Example Action: A recent policy change by the Liquor Distribution Branch allows land-based wineries and cideries to free-price their product when selling to hospitality customers. The Liquor Distribution Branch also recently launched a website with a catalogue of the current Established Retail Prices so that this information is readily available for products that are not subject to free-pricing.